These photos were taken on January 16, 2018 at 7:49 AM. The location was a very nice upper mid scale hotel in the Dupont Circle District in Washington DC. The "Take It!" came when I for what reason I do not know, decided to do a little wandering in the lobby of this very nice hotel and happened upon this Hour Glass which I had seen before when It was in a book case, located elsewhere in the lobby. In its new location it was to be seen in a whole new light. It had moved from being in the shadows to now creating them with the addition of the overhead light. Amazing to me how the contours of the glass brings about shadows from the shaping. The After Take: Finds me visiting this new found shadow as it is a form I intend to replicate in my home. It will take a while to assemble the pieces, and will not be done for a while as I am so busy with other projects, but when I do - It will be shared. Until then - wishing you my best. I'm not sure which is prettier, the shadow or the hourglass itself. 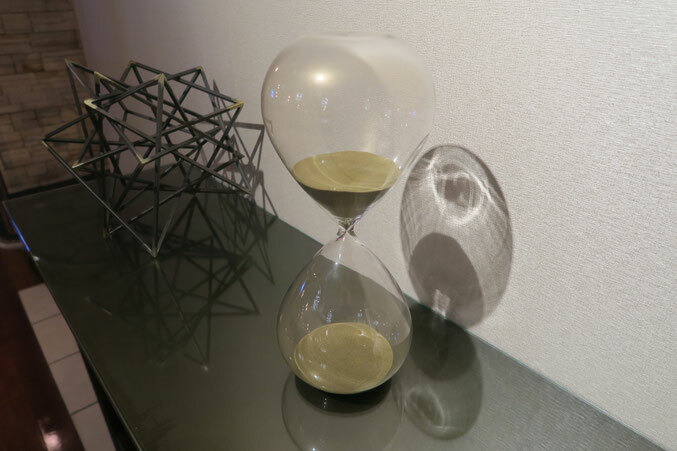 We have a big hourglass like this that uses magnetized dust. We use it for time outs and over the years every single one of our children have tried making it go faster. What a pretty reflection! It reminds me of a lightbulb. Great photo as always. How is the recovery coming along? I wonder how much time it does per flip. I spent a couple minutes looking at the hourglass and its reflection then I noticed the strange piece of angular art to the left of it and it completely stole the show for me. It wouldn't fit with the decor of my house but I wish it did, love it!